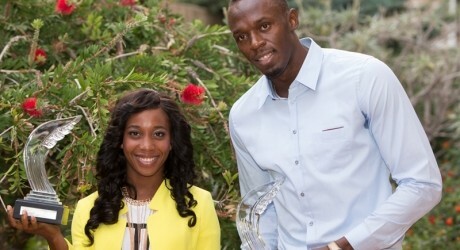 It’s hardly a surprise, but for only the third time in history, two athletes from the same country have won international track and field’s top award, as Jamaican sprinting superstars Usain Bolt and Shelly-Ann Fraser-Pryce were named male and female Athletes of the Year by the IAAF. The two, who dominated this year’s IAAF World Championships in Moscow with gold medals in the 100m, 200m and 4x100m, were handed the coveted trophies at the IAAF Gala and Awards ceremony at the Salle des Etoiles here a short while ago. Only twice before have athletes from the same country copped the prestigious awards, with Americans Carl Lewis and Florence Griffith Joyner in 1988 and Britain’s Colin Jackson and Sally Gunnell in 1993 being the others. Fraser-Pryce, who is winning the World Female Athlete of the Year award for the first time, became the second Jamaican female on the list of winners after Merlene Ottey in 1990. 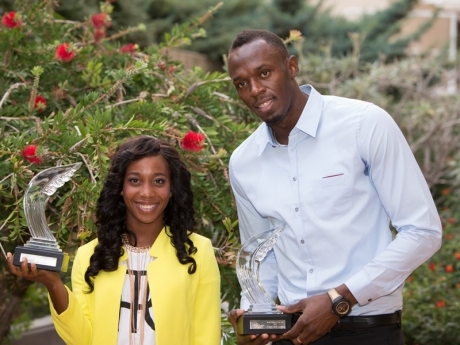 Fraser-Pryce said “It feels good” to have won the award. Asafa Powell (2006) is the only other Jamaican male to have been named Male Athlete of the Year. This is Bolt’s fifth award after wins in 2008, 2009, 2011 and 2012.